Discussion in 'Draft Games Forum' started by Indnyc, May 9, 2018. Poll closed May 10, 2018. Too much attacking power. It's a forward line that can make the difference against MJJ's defence. To me the Dalglish/Hughes combo will test Burns and Beattie to the limit, Lennox will burst between Nicol and Burns to capitalise on his immense goal threat, while Waddle's trickery should trouble the hard-tackling if somewhat rash Pearce. Collectively there is a range of attacking weaponry - width, invention, incision, pace, strength, aerial ability - there that will be hard to defend against. 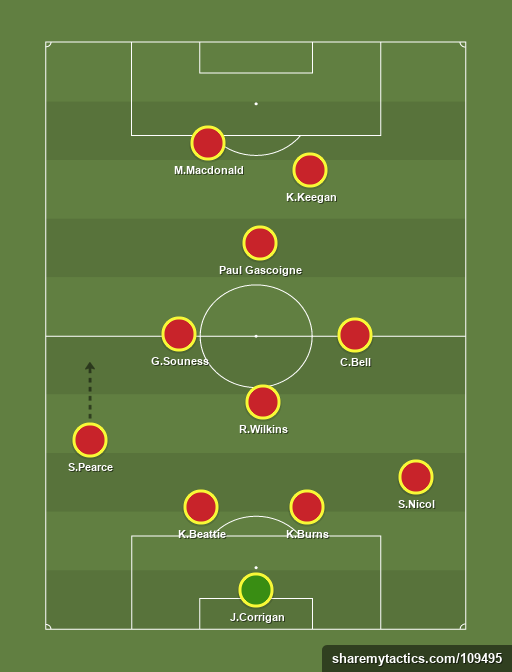 The move to 4-2-3-1 is about getting the best out of Kenny Dalglish and Glenn Hoddle. Dalglish drops into the hole where he was almost undefendable for Celtic and Liverpool. Hoddle meanwhile is in the same right central midfield role he shone so brightly with at Monaco and Spurs, with runners and creative options aplenty ahead to unleash his passing ability upon. Stopping one of them might be possible, but both is unlikely. The team benefits from a serious core of leadership of the greatest ever 'Ger John Greig, the serial winner Richard Gough, the all-conquering-captain-at-23 Kevin Ratcliffe and Leeds United captain and legend Billy Bremner. The influence that central core will have on the rest of the team and the outcome of the game cannot be underestimated. Up top the Dalglish and Hughes pairing both shone when the pressure was greatest, delivering the goods in major European finals time after time. Defenders who can nullify MJJ's forward line: Gough's dynamism and combativeness squares up welll to Keegan's bustling game; Greig can pull in tight to keep tabs on Bell and beef up the central midfield area, while Anderson should be able to handle Armstrong. And Ratcliffe is always on hand to mop up with his searing speed and razor-sharp reading of the game. Joe Corrigan- England's third best goal keeper in the 70s, behind shilton and clemence. Stuart Pearce- One of England’s greatest defenders; a tough-tackling, no-nonsense full-back with a terrific left foot which helped him register 87 career goals. Kevin Beattie- One of the the most complete footballer ever, he had everything that a player could hope to have in pace,strength,tackling ability,great in the air,powerful shot. Injuries cut his international career short otherwise would have enjoyed a much greater reputation. Made his England debut at 19. Kenny Burns- Winning player of the year based on his defensive performances for Forest and a crucial part of the side which dominated Europe in the late 1980s. Steve Nicol- One of the most versatile and ambidextrous players ever. Nicol was a great defender, but also a superb attacking player. He was quite adept at taking on defenders and an accurate crosser of the ball. Won the player of the year award in 1988/89. Graeme Souness- Legendary box to box midfielder and a key component of the liverpool side that dominated europe. Ray Wilkins- The king of cockney, captained chelsea at the young age of 19. A superbly talented central midfielder with excellent vision, ball retention and passing skills. Colin Bell- Nicknamed Nijinsky(racing horse) for his superb stamina. One of englands greatest all round midfielders, Bell had it all. Superb vision, first touch and the art of controlling the game. Playing in his favourite RCM position. Paul Gascoigne- Gazza is widely regarded as one of the most gifted British footballers ever. At his best he was a compelling to watch with his sublime skill, improvisation and ability to hold of defenders with ease. He may well be 'as daft as a brush' but was also a great combination of attacking flair and a tenacious never say die attitude. Kevin Keegan- Only englishmen to win Ballon Dor twice!!! Malcolm Macdonald- One of the best pure goalscorers the english game has seen,known for his superb pace, aggression, work-rate. Liked to drop into midfield to pick up the ball as well. Malcolms' pace will ensure that Gio's side are going to defend deeper which will allow keegan and gazza to play closer to the goal where they can exert the most damage. Overloading the midfield and having two players who can win the game on their own in keegan and gazza. Playing a 4-4-2 against my side will allow me to dominate the middle and pull his players out of position. Bump.. No comments so far? Sorry I've been busy all day so haven't had much chance to get online. Saw the votes and decided not much point. Strange. Very surprised at the votes. Thought MJJ has this match. Not a fan of Dalglish as #10 or even that Dalglish/Hughes combination. I rate Hughes ability in a 2 striker combo for his physical playing style and ability to hold up the ball. Strengths, I don't see utilized well in this combo with Dalglish. I also don't see Gio's midfield stopping Gazza/Keegan either. With Wilkins there in Dalglish's space, he seems to have tactical edge too. Rate Nicol, but Lennox was something in his peak. Fantastic goalscorer and he's the one who'll benefit most from Dalglish and Hughes.